Columbia-Greene Humane Society/SPCA is dedicated to the protection, humane treatment, and well being of all animals. This mission will be accomplished by our commitment to community outreach, humane education, and prevention of cruelty to animals. We do not euthanize animals for space constraints and do not receive any federal, state, or county funding. Looking for information regarding the 2018 Paw Picnic Fundraiser? Click Here! With the opening of the new Columbia-Greene Humane Society/SPCA, there are many new services being offered. The shelter will now be open seven days a week, from 11:30 a.m. to 4:00 p.m., including Sundays. The shelter hosts birthday parties for children who are in grades kindergarten through 6th. The parties include use of the shelter’s multi-purpose room for two hours, decorations, touring the shelter, a visit by a certified Therapy Dog International (TDI) canine, and as a special gift, the birthday boy or girl gets to name a cat or kitten. CGHS/SPCA's new facility includes a separate wing designed for boarding and doggie day care for the public. The boarding center is state-of-the-art and boasts large indoor dog enclosures with window views, outdoor play areas, and nature trails for leash walks. Each enclosure is equipped with the Mason Sani-System—the safest dog kennel system on the market today. CGHS/SPCA also offers a variety of grooming services to the public. When you patronize the shelter and take advantage of our top-notch services, not only does your pet get great care, but to top it off, all proceeds go to a good cause: supporting the homeless animals being cared for by the shelter. For more information on any of these services, please call (518) 828-6044 ext. 100. One evening this past March, a delivery person (whom we will call Jim) was dropping off a package at a house that appeared to be abandoned. Jim was quite certain that his delivery address was correct, but the condition of the place suggested it was deserted. After he walked around the house to see if he could tell if it was still occupied or not, he decided it was, in fact, abandoned and started to walk away. But when he crossed the deck to leave, he heard a sound in the house. Jim approached the sliding glass door, and to his horror, he saw a dog approach the glass. Jim immediately contacted our 24-hour cruelty hotline and reported that he had seen a dog that was hairless and covered with lesions, whose eyes were shut, and that he thought the dog was trapped in an unoccupied house. His feeling was that the owners had moved out and left the dog behind. 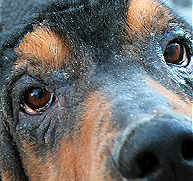 One of our cruelty investigators went on the call right away and arrived to find a Black and Tan Coonhound that had a severe case of mange and was infested with fleas and internal parasites. The hound had serious eye infections that had never been treated, and his living quarters were covered with feces and urine. With the help of the local Sheriff’s Department, our investigator was able to locate the owner of the house and question him as to why this dog was in such horrible shape. The owner said he lived at a different location and stopped by occasionally to give the dog (named "Buford") some food. He told our investigator that Buford had lived in those conditions for over two years and that he was always sick. He even said that Buford just had "bad luck"! Well, Buford’s luck was about to change. Our investigator seized Buford and brought him to the Columbia-Greene Humane Society/SPCA for veterinary care. Buford was in bad shape. The mange had gone untreated for so long that his skin was permanently scarred. Because Buford had never received treatment for his eye infections, he had sustained permanent impairment to his vision. Buford's outlook had been bleak he had been dealt a bad hand in life. However, CGHS/SPCA maintains a strict zero-euthanasia policy for adoptable animals. We believe in new beginnings. Since you, our supporters, have always been there for us, we’ve always been there for animals in need—just like we were for Buford. With your assistance, we were able to give Buford the care and medical treatment he so desperately required and deserved. Thank you! The 3rd Monday of every month CGHS brings an adoptable pet to News Channel Ten to be showcased in Pet Connection with Steve Caporizzo. Tune in to Channel Ten News around 5:45pm. CGHS/SPCA has opened a Food Bank to provide free food for dogs and cats (or other pets, by special request) to those in need. It is open from 11:30 a.m. to 4:00 p.m. during normal hours of operation. We are soliciting donations for the Food Bank from our supporters. Any dry or canned cat or dog food donated will be appreciated and is tax deductible. Having birthday party guests bring dog or cat food for the Shelter is a great way to obtain donations for the Food Bank. 4.15.2019 … and then there’s Maude!